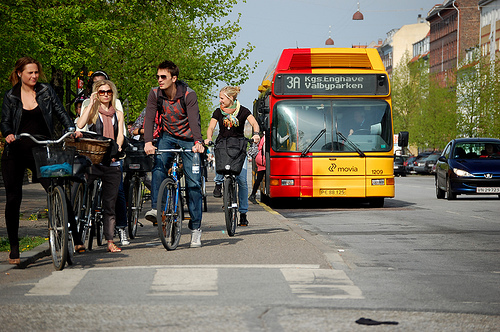 Bike and bus lanes make Copenhagen more livable. Photo via Spacing Magazine. Well-being Outdoors – Initiatives that will help citizens feel safe in public spaces, as well as initiatives that help create identity and a sense of belonging. Independent Living – Initiatives that will help the growing number of elderly people living alone to feel secure and comfortable in a city and/or enable longer living at home with appropriate access to healthcare. Healthy Lifestyle at Work and Home – Initiatives that will support a healthy body and mind, whether through a person’s surroundings or via other essentials such as exercise, sleep and diet. The three award grants total €125,000. The contest will be open until October 2010, and winners will be announced in April 2011. Sustainable mobility is key to the “livable cities” concept, so if you have an idea, enter the contest! The London-based international consulting company Mercer releases its “Quality-of-Living” rankings annually, including 39 factors across 10 categories, like recreation, housing and public services and transportation. This year, Vienna, Austria came out on top for best quality of life. Mercer also released a list of the top “eco-cities,” with Calgary, Canada ranking highest, based on water availability, water potability, waste removal, sewage, air pollution and traffic congestion.